Vorschlag zur bevorzugten Beförderung (Proposal for Accelerated Promotion) for Friedrich-August von der Heydte. Nicknamed the Rosary Paratrooper, Friedrich-August von der Heydte was born on March 30, 1907 in Munich. In the 1920s he served in the 18th Cavalry Regiment before pursuing his studies at the Universities of Munich, Berlin, Vienna, Graz and Innsbruck. 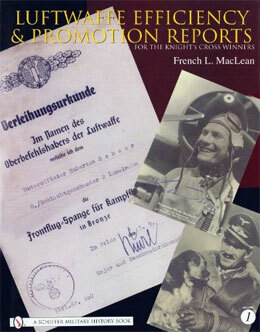 He rejoined the Army in the 1930s, but trasnferred to the Luftwaffe in 1940. At the airborne invasion of Crete, he commanded the 1st Battalion of the 3rd Paratroop Regiment, winning the Knights Cross for his actions at the village of Agia in Prison Valley. In 1942 he fought at El Alamein; he also fought in Russia. He commanded the 6th Paratroop Regiment at Carentan, Normandy in June 1944 against the US 101st Airborne Division. He was promoted to Oberstleutnant (Lieutenant Colonel) and received the Eichenlaub (Oak Leaves) for those actions in France. During the Battle of The Bulge, von der Heydte commanded a special airborne battle group that dropped behind American lines. Seriously wounded, he was captured by American troops. Later in life, he became a Fellow in the Carnegie Endowment for International Peace. Friedrich-Wilhelm von der Heydte died on July 7, 1994 at Aham an der Vils, near Landshut in Bavaria. If you visit the Ardennes/Battle of the Bulge with Colonel MacLean, he can show you where von der Heydte landed and was captured in 1944. This document is signed by Kurt Student in his customary pencil. It is initialed by Bruno Loerzer.